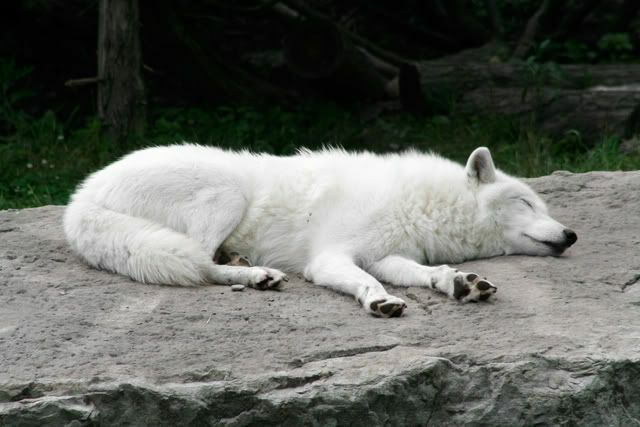 Above: Something you won’t see in the wild–a wolf sleeping in the open. This last week was Wolf Awareness Week and this weekend concludes the focus on the wild canine. Wolf Awareness Week is a time when people are encouraged to get in touch with their wild nature by attending wolf celebrations and educational programs held across the United States. Our fast paced lives can disconnect us from nature, but personal involvement brings matters home–and each person’s involvement can really make a difference to make this week a howling success. Wolf Awareness Week can instill a sense of ownership and participation of the natural world. Even though wolf recovery programs have made good progress, many challenges remain. Wolves historically inhabited most of the lower 48 states, until government extermination programs and unrestricted hunting killed almost all of them by the early 1900s. Wolf populations have only recently started to recover in Greater Yellowstone, the Northern Rockies, the Great Lakes and the Southwest regions of the country. Wolves have been brought back from the brink of extinction but they still inhabit only a small portion of their original range. Earlier this year the wolf was going to be delisted in the Northern Rockies. Recently it was announced that the government was going to withdraw the rule to remove wolves from the endangered species list. This move was thought to be in response to legal action by Earth Justice on behalf of the wolves. There are many challenges facing this large predator including illegal hunting, habitat encroachment and restriction, and hostile state management. Zoos and other animal educators provide close encounters with wolves to help educate people about their vital role in the environment in the hopes that the perceptions about wolves will change. Defenders of Wildlife, founded in 1947, are one of the leading organizations working for the conservation of wolves and other predators. Advocates from the group conduct extensive public education programs on how to coexist with wolves. Staff members travel across the country hosting seminars and discussion programs on wolf behavior and human/wolf interactions. Their goal is to raise public awareness about the important role wolves play in the environment. People today don’t realize that when there are healthy populations of predators, the ecosystem and other living creatures within it thrive. Nature balances itself out and we humans tend to meddle and make a mess of things. Predators are known as “flagship species” since they alert and motivate people to support conservation efforts. The conservation efforts and attention sparked from concern about the larger predators (aka flagship species) ultimately leads to the healing and recovery of the damaged environments and saves a number of plants and animals that don’t have the same allure for the general public but that are very important to the ecosystem. Efforts such as Wolf Awareness Week can instill a sense of ownership and participation in the conservation of the natural world. Personal involvement in events during such campaigns brings matters home–and each person’s involvement can really make a difference. So, I encourage you to get out and celebrate Wolf Awareness at zoos and wildlife facilities this weekend. Defenders of Wildlife and other wildlife organizations are sponsoring regional events in many areas across the country. Activities include presentations by wolf experts, children’s activities, guided tours of wolf facilities and more. Read more at US Fish & Wildlife’s Northern Rockies Western Gray Wolf page and get wolf curriculum for the classroom here.